Gov. Rod R. Blagojevich of Illinois was arrested and charged with corruption, including an allegation that he conspired to profit from appointing a senator to succeed Barack Obama. U.S. Attorney Patrick Fitzgerald discussed the charges against Gov. 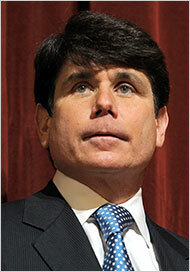 Rod R. Blagojevich of Illinois at a news conference in Chicago on Tuesday. Mr. Blagojevich, a Democrat, called his sole authority to name Mr. Obama’s successor “golden,” and he sought to parlay it into a job as an ambassador or secretary of Health and Human Services, or a high-paying position at a nonprofit or an organization connected to labor unions, prosecutors said. He also suggested, they said, that in exchange for the Senate appointment, his wife could be placed on corporate boards where she might earn as much as $150,000 a year, and he tried to gain promises of money for his campaign fund. Gov. Rod R. Blagojevich of Illinois. If Mr. Blagojevich could not secure a deal to his liking, prosecutors said, he was willing to appoint himself. “If I don’t get what I want and I’m not satisfied with it, then I’ll just take the Senate seat myself,” the governor said in recorded conversation, prosecutors said. The charges are part of a five-year investigation into public corruption and allegations of “pay to play” deals in the clubby world of Illinois politics. In addition to the charges related to Mr. Obama’s Senate seat, they include accusations that Mr. Blagojevich worked to gain benefits for himself, his family and his campaign fund in exchange for appointments to state boards and commissions. The authorities recorded Mr. Blagojevich speaking with advisers, fundraisers, a spokesman and a deputy governor, using listening devices placed in his office, home telephone, and a conference room at the offices of a friend, prosecutors said. 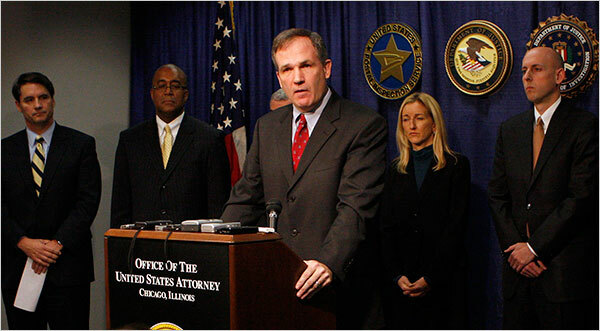 Federal authorities said Mr. Blagojevich’s chief of staff, John Harris, was also named in the complaint. Both men are expected to appear in federal court for the first time later Tuesday. “The conduct would make Lincoln roll over in his grave,” Mr. Fitzgerald said. You are currently browsing the archives for the indictment category.